From the earliest days of St. Anthony's home, the children have been taught the importance of self-reliance and self-help. 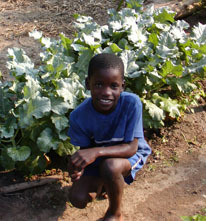 First the children are taught how to use the land to grow vegetables. Then we went into the business of dicing scallions. This promotes self-sufficiency, supports the family, and trains children in self-reliance. If you would like to donate gifts-in-kind instead of money, items such as school supplies, clothing, toiletries, linens, or items such as diapers, and pantry items, they are certainly in constant need. A charity organization called FOOD FOR THE POOR is the best way to send these items to us. They will also send you receipt for your donation for tax purposes. Please be sure to note on all donations: "For St. Anthony's Children's Home, Jamaica, Source Code 76504".